The use of colors to differentiate ritual seasons is common in the Western church, and the Advent season is no exception. To northerners, Advent coincides with a time of year when the sun is low, snow is in the air, and nature’s spare palette pairs well with the austere darkness of this liminal time. One need only experience a winter forest at dusk to appreciate the blue blush of snow, the pink wash of the evening sky, or the black and white of a dormant birch cluster to see through a more minimalist lens. It is the perfect setting to prepare oneself for the great spiritual emptying that is Advent. While it is easy for those who live in winter climes to associate the colors of Advent with nature’s winter palette, there is more to the story behind Advent’s blues, purples, whites and pinks. As you’ll see, the symbolic use of these colors transcends nature or climate. One need not reside in a winter setting to appreciate their rich meaning. 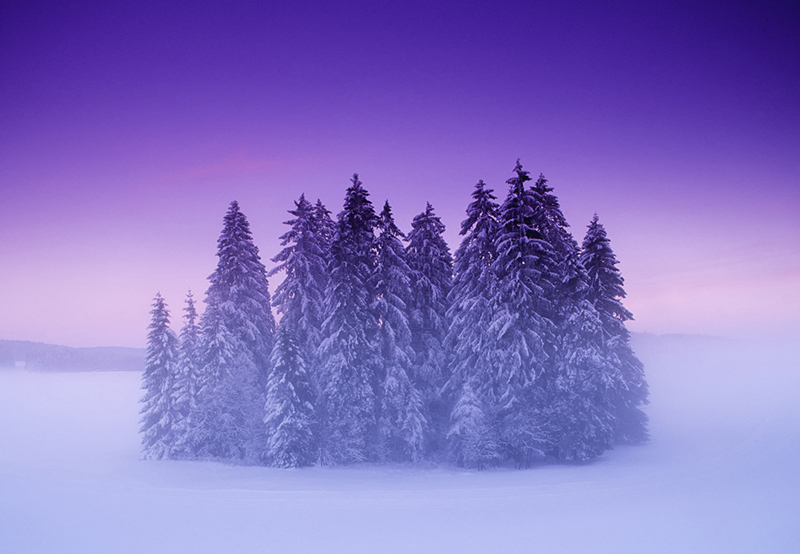 Purple (or violet) has traditionally been the primary color of Advent. It is the color of royalty and the sovereignty of Christ. The presence of purple demonstrates the anticipation of the coming King. Since purple is also the color of penitence and fasting, it has become the primary color of Lent as well. Thus, blue is often used during Advent as a means of distinguishing Advent from Lent. While blue may also be seen as a color of royalty, it offers additional layered meaning. It signifies the color of the night sky which provides the backdrop for the Star of Bethlehem. Blue also suggests the waters of the new creation in Genesis 1. Today, we take color for granted. For artists and designers, it costs no more to use blue in a web or print graphic than it does to use yellow or green. In Medieval and Renaissance times, however, some colors were beyond the reach of most artists. Pigments used to produce the color blue were produced from lapis lazuli, a stone imported from Persia with a value that surpassed gold. In fact, it was the responsibility of the patrons of art, not the artists, to cover the costs of using colors like blue and gold because the artist could not afford them. Paintings, then, that swathed Mary in gowns of blue were an expression of profound glorification and devotion. The color pink finds its meaning during the third week of Advent, which begins with Gaudete Sunday. To be true to the color, it is more correctly referred to as rose rather than pink. Think of it as the color of joy. The color rose represents the beginning of the transition from darkness to light and a turning away from penance to celebration, a foretaste of the coming Christmas celebrations. Thus, the term Gaudete, which refers both to rejoicing and enjoyment. Culturally, white is the non-color. It is the blank canvas, the unused sheet of paper, the wall ready to be adorned with art. It represents emptiness and space, waiting to be filled. Yet, it is no accident that the fifth candle of the Advent wreath, the Christ candle, is pure white and positioned in the center. Advent white represents divine purity, virginity, innocence, light, and birth. In the night sky, white is the color of the stars. Advent white is the symbol of a sinless, spotless cosmic Christ as pure savior. In the human visual spectrum, the presence of all colors layered together results in their being washed out to nothing but white. White is the eschatological color of Advent, a color somewhat outside of our rational assumptions of white as a non-color. Eschatology is concerned with the final coming, the Advent of humanity’s ultimate destiny. The white of Advent is the coming of radiant light into a cold, dark and dying world. Those who enter into this cosmic story are said to be washed of their sins and made whiter than the fallen snow. So, while the colors of Advent are indeed echoed by the colors of winter, may these colors be a reminder to us that we are a ritual people, and that ritual symbols are kept vital only as long as we celebrate them and keep them alive. The colors of Advent point to poignant mysteries and sacred meaning that is too easily forgotten in our commercial build-up to Christmas. Advent is a return to a season in which we light candles to consecrate the deep dark that so many others may eschew. It is the time when white becomes color, and pink exudes joy. May your Advent be blue in all the best ways.